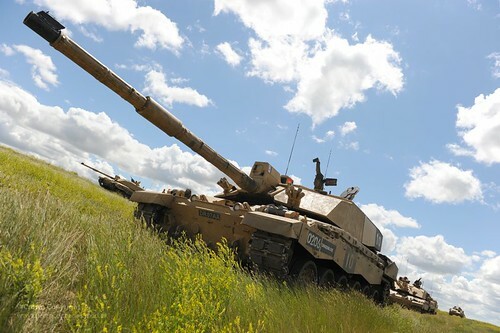 A Challenger 2 Main Battle Tank is pictured on exercise with the Army in Canada. Units from 12 Mechanized Brigade have been training at the British Army Training Unit Suffield (BATUS) on the prairies of Canada for the past three months in preparation for their deployment to Afghanistan in early 2012. The exercise includes a live fire stage featuring multi-purpose machine guns, heavy artillery AS90 guns, Challenger 2 tanks and Warrior armoured vehicles, before switching to a Tactical Engagement Simulator Exercise (TESEX), which involves no live ammunition and aims to further develop the skills learnt during the live fire stage in a safe environment. The soldiers use the state-of-the-art computer-backed system where their weapons and vehicles are fitted with the laser-quest-style system to record every detail of an attack, showing simulated injuries from gunfire, shrapnel or mortar attack during a mission. This entry was posted in Exercise and tagged Brigade, Canada, Challenger, Mechanized, Tank. Bookmark the permalink.